One of the benefits of owning a luxury car is that when you take it in for service, often you get to drive a vehicle of the same brand and not have to wait. But when a disabled Army veteran brought his service dog to his Mercedes dealer, they said he couldn't drive a Benz with his companion. According to Automotive News, dealerships are not always familiar with the laws regarding the Americans with Disabilities Act and how it relates to accommodations regarding service animals. When retired army paratrooper Diego Hurtado took his Mercedes C300 in for a service appointment, he expected to have another a loaner Benz waiting for him. But when the dealership staff saw his service dog, they said they could not give him a Mercedes due to a policy against animals in loaner cars. The dealer said they would provide a Hertz rental car in the way of a Chrysler 200. Hurtado's service dog is a a golden retriever and yellow Labrador mix, that is trained to help him with orthopedic and balance problems and aids his post-traumatic stress disorder. "When my service dog gets questioned," Hurtado said, "it pushes me into anxiety." One of the issues is that there are people who falsely claim their animal is a service animal just to get preferential treatment. This makes life more difficult for those that have legitimate needs for a trained service companion. The other problem is that many business are simply unaware of the laws regarding service animals. However denying someone equal treatment because they have a service animal is illegal and could result in a costly lawsuit. Due to the unfair treatment by the Mercedes dealership, Hurtado got an attorney involved and sued the dealer for damages due to their alleged violation of the ADA. According to the settlement the dealership must pay Hurtado $5000 in damages in addition to his legal fees and conduct training for their employees on how to properly handle customers with service animals. 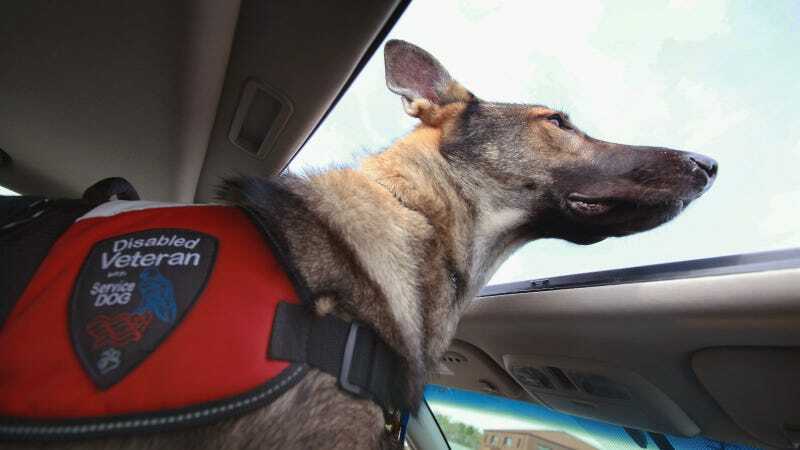 Unfortunately, Hurtados' case was not the only time a dealerships lack of training about service animals resulted in unfair treatment of a disabled customer. When Tarra Robinson brought her service dog to test drive an SUV at her local dealership the staff wouldn't allow it. The dealership's staff said the dog would shed in the car and leave a mess that they'd have to clean up. She told staffers that Duchess was a working service dog, but they said that taking Duchess along was inappropriate. Robinson refused to give the dealership business, but also found her car search to be frustrating due to the lack of awareness from the dealerships. She eventually found a dealership in Austin who was understanding and accommodating to her situation. It seems they didn't care about vacuuming out a little dog hair when they can have a happy customer and make a sale.